¶ 1 Leave a comment on paragraph 1 0 Non-collectors of all ages might learn about stamps from collectors sharing their specialized knowledge at public exhibitions. Americans of all income levels were becoming accustomed to public exhibition as a form of amusement as a way to learn about faraway places from midways at World’s Fairs, oddities at dime museums in entertainment districts, and art and natural history at new museums opening in cities across the U.S. Advertisements for large stamp exhibitions were placed in the entertainment sections of newspapers, so that in New York one found the International Stamp Exhibition among listings for musical performances at Carnegie Hall, motion pictures starring Adolph Menjou and Harold Lloyd, operatic productions by Gilbert and Sullivan, and a play by Theodore Dreiser. Museums, in particular, offered a model for viewing and revering objects within an ordered context—and in the case of stamps, the album often served as a display case in public spaces.1 Public exhibits provided a physical venue for philatelists to show off collections and investments to a broader audience beyond fellow philatelists. ¶ 2 Leave a comment on paragraph 2 0 Thousands of visitors attended the New York International Stamp Exhibition in 1913, the first large American philatelic exhibition. British philatelic writer Fred J. Melville contributed a guest column to the New York Times during the exhibition praising the quality of exhibits. He joked that they justified his long trip to the U.S. to view the show, and enjoyed seeing that Americans were beginning to appreciate the “cult” of the stamp as much as British and European collectors. Melville’s article offered some reassurance to American club collectors looking for approval from their big brothers in philately—the British and Europeans—for this exhibition.2 Interestingly, one New York Times reporter covering the exhibition noticed a “democratic character” to the exhibitors, which he attributed to the popularity of stamp collecting, because a “humble artisan” or a monarch could collect stamps.3 Anyone could collect and they did. The collectors exhibiting, however, invested time and money in their leisure activity. Public exhibitions such as this one, exposed non-collectors to the possibilities of the stamp market. Describing collecting as “democratic,” fit appropriately with American ideals according to the reporter, even if philately originated in Europe and stamps themselves arose from needs of the British Empire. ¶ 3 Leave a comment on paragraph 3 0 Articles discussing the exhibition also emphasized that stamp collecting was not only about classifying stamps but about accumulating value and focused on the monetary values of the stamps exhibited. Non-collectors learned that while postage was assigned a specific monetary value, collectors created their own alternate market for valuing stamps. Often articles in the mainstream press did not elaborate on how philatelists determined the value of a stamp or an entire collection. Visitors to an exhibition only saw that rare collections amassed by people like George Worthington were worth tens of thousands of dollars. One article described the rarities of Worthington’s stamps, including a Cape of Good Hope stamp with a woodblock error.4 To non-collectors the world of stamp collecting was a bit mysterious because it valued errors in printing that elevated a stamp that originally cost two cents to a value of ten thousand dollars. Without knowing the whys of the stamp market, stamp collecting appeared to possess a lottery-like quality that attracted some non-collectors. At a time when no legal lotteries operated in the U.S., a person might dream of stumbling upon a valuable old stamp in a trunk and selling it for thousands of dollars. In that scenario, luck trumped philatelic expertise, making the discovery of riches in stamps accessible to all. ¶ 4 Leave a comment on paragraph 4 0 Clubs also sponsored smaller, local exhibitions to re-invigorate dormant collectors’ interest and attract new ones. The Stamp Collectors’ Club of Hartford hosted a World War I-themed exhibition not only to display rare varieties from their members’ collections, but to increase collecting activities in Hartford. Sponsoring an exhibition from the United States Postal Service, the Boston Philatelic Society used almost exactly the same words to describe why they pulled together this public event—to interest “our non-collecting citizens,” to bring back one-time collectors, and to offer unaffiliated “worthy collectors” an opportunity to associate with the club members to encourage them to join.5 The press gave collecting clubs mainstream media coverage of their events and helped to spread the word about stamp collecting. ¶ 5 Leave a comment on paragraph 5 0 Organizers staged stamp exhibits in or near cultural centers in big cities to associate stamp collecting with other high-brow activities. Cultural hierarchies divided public events into high and low categories to distinguish behavioral norms and restricted audiences.6 Philatelists clearly desired to associate its activities with institutions of learning and culture. The Art Institute of Chicago hosted an exhibition celebrating the twenty-fifth anniversary of the American Philatelic Society in 1911, and the Wadsworth Atheneum in Hartford, Connecticut, sponsored an exhibit on war issues in 1921. The 1913 New York International Stamp Exhibition was held at the Engineering Societies Building in Manhattan, located within one block of the New York Public Library and near the shopping district on Fifth Avenue. The exhibition opened near the central cultural and commercial district in the city, and was located in the same building as a scientific association.7 Locating a stamp exhibition in such spaces not only helped to legitimize the hobby, but also physically connected collectors with institutions commonly associated with learning. Not only did philatelists desire to connect their practices with places of learning, but tried to attract people who thought of themselves as middle class who valued cultural institution. ¶ 8 Leave a comment on paragraph 8 0 In this traditional family unit, the father figure, wearing white-collar attire, pointed to the stamps and discussed them with his son. Here, knowledge was transferred from stamp to adult to the child. By giving a boy a chance to learn, philatelists argued, “the postage stamp” became the “common bond,” getting him “in touch with the rest of the world,” including countries “most of us never heard of.” Missing from the image are reference books and maps that might help a young collector to contextualize imagery on a stamp alone. 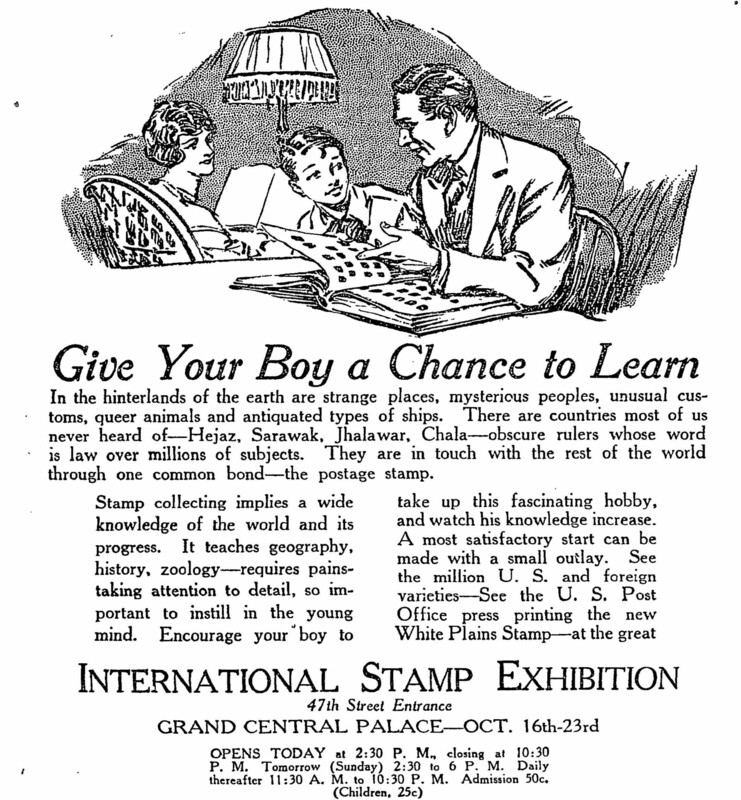 Boys and their fathers learn together, and as the ad instructed the reader stamps taught geography, history, and zoology, implying that some of this knowledge was inherent directly from the stamp without needing any outside literature. ¶ 9 Leave a comment on paragraph 9 0 This learning process appears to be very masculine. Interestingly, the ad makes no mention of stamp values or the possibility of earning money. When framed as an educational pursuit, the economics of collecting were often omitted from the discussion. The ad’s imagery depicts a stereotypical middle-class household scene in the 1920s that combines with the copy to argue that this indoor and non-athletic activity was indeed masculine. Employing a tone of exoticism by referring to “mysterious peoples” and “unusual customs” represented in stamps, the subtleties of collecting’s connection to masculinity and empire become clearer. ¶ 10 Leave a comment on paragraph 10 0 Presenting collecting activities in this way reinforced the notion that while real government agencies produced stamps, the places represented on stamps are almost imaginary. If stamp collecting “implies a wide knowledge of the world,” the type of knowledge may not be that wide but instead rather narrow. International stamps functioned as a type of souvenir from a country most collectors never visited, forcing both the collector and other spectators to view the stamp in uncritical ways. Stamp exhibitions perpetuated this idea, which was not an unfamiliar concept to most Americans who regularly read cultural objects from a tourist perspective. Collectors knew that stamps carried different messages, and the non-collecting public increasingly learned to see stamps as meaning-filled pieces of paper.